In fungal spore formation the wall building mechanisms that are normally strictly apical are highly adapted. Clearly, wall synthesis at the hyphal apex is far being the complete story. Further synthesis of new wall as well as modification of existing wall is a frequent occurrence. When and where it occurs is under exquisite control. There are so many instances in which fungal wall synthesis is positionally and temporally regulated to produce regular change in morphology that the activities located at the apex of the vegetative hypha, described in detail in Chapters 4 and 6, are much more mundane by comparison. There are several ways of creating spores and several ways of organising the walls of spores and, as you might imagine, several terms have been coined to describe these. ring wall building, in which wall synthesis is concentrated in a ring below the tip and produces new wall by proximal growth, so a cylindrical hypha is formed in which the youngest wall material is always at the base (Fig. 3C). You will appreciate that an infinite range of hyphal cell shapes can be produced by sequential operation of these processes. Add hyphal branching and control of autotropism (either +ve to cause the branch to grow towards its parent and thereby form a multihyphal structure, or –ve to cause the branch to grow away from the parent to generate an open network) and it is possible to account for the formation of a wide range of spore-bearing structures (sporophores, specifically, conidiophores). Fig. 3. Different ‘wall building’ processes involved in hyphal differentiation. Fig. 3A shows apical wall building, in which the ultrastructural secretory vesicles responsible for producing cell wall material are concentrated at the hyphal tip and form a cylindrical hypha by distal growth, in which the youngest wall material is at the extreme apex. Fig. 3B: diffuse wall building, in which the synthetic secretory vesicles are distributed all over the apical region at a low concentration, resulting in swelling of the cylindrical hypha through alteration of the pre-existing wall. Fig. 3C: ring wall building, in which wall synthesis is concentrated in a ring below the tip and produces new wall by proximal growth, so a cylindrical hypha is formed in which the youngest wall material is always at the base (Minter et al., 1983a & b). Redrawn and modified from the Dictionary of the Fungi. And that accounts for both the enormous biodiversity in asexual sporulation throughout the fungi, and the central role in classical taxonomy played by those spores and spore-bearing structures. been given an equally wide variety of descriptive names. The prime source for explanation of names and terms in mycology is the Dictionary of the Fungi (Kirk et al., 2008), and a good alternative is the Illustrated Dictionary of Mycology (Ulloa & Hanlin, 2012). In this Resources Box we use extracts from the Dictionary of the Fungi to show you both something of the range of diversity that has been observed in fungal cells and the usefulness of this reference source. CLICK HERE to visit a page providing details of these. The main purpose of this Resources Box is to introduce you to the diversity of spore and hyphal morphology, and to the diverse terminology developed by mycologists to describe this. However, you should take the opportunity to examine the range of morphologies shown, so that you can understand how shape of a spore or hypha can be determined by precise control over the timing and position of renewed wall growth varying the formation of wall and associated machinery. Conidiophores are usually morphologically distinct from the vegetative hyphae on which they arise. They may be branched or unbranched and often have inflated apices supporting groups of conidiogenous cells. Conidiogenous cells differ in the way they produce conidia, which may be formed singly, in clusters, or in succession. When conidia are produced in succession, the chains that are formed may have the oldest conidium located at the apex of the chain, being pushed upward as younger ones form at the base, or conversely the chain may be formed by successive production of the youngest conidium at the apex. Mature conidia may be smooth or bear ornate sculpturing, and their surface layers may be modified to make them hypdrophobic or hydrophilic. Conidia are often round or ellipsoid but may be curved, coiled, or of more elaborate shape. Conidia are usually single cells, but may be made up of two to several cells. Some are colourless, but many form pigmented walls, accumulations appearing white, blue, green, yellow, brown, or black. Recognising the ways in which the hyphal wall can be formed turns an observational study of the different shapes of the final structures into an understanding of the ways that conidia develop. Some fungi produce spores by transforming an intercalary cell (that’s a cell ‘in amongst others’ or within the body of a hypha) into a chlamydospore by rounding up of the cells and deposition of wall thickening (= diffuse wall building and secondary wall formation). Chlamydospores are released when the parent hypha disintegrates. This is one of two basic sorts of conidiogenesis, called thallic development (the other is called blastic). In thallic conidiogenesis (Fig 4A) the spore initial differentiates after it has been delimited by completion of one or more septa, and the spore is differentiated from a whole cell. The spore initials are delimited by septa formed after apical growth of the fertile hypha has ceased. Chlamydospores are enlarged and enlargement occurs only after the septa are formed. Spores that undergo this type of development but without enlargement are often given special names such as oidia, found on haploid monokaryotic mycelia of many of the smaller mushrooms, like Coprinopsis, or arthrospores, which are formed by fragmentation of hyphal branches of members of the Ascomycota like Geotrichum, but they are all thallic conidia. However, they may be distinguished as holothallic or enterothallic on the basis that the former type uses the original wall of the parent conidiogenous cell, while in enterothallic conidiogenesis the conidial wall is newly formed and does not use the original wall of the conidiogenous cell (Fig. 4A). Enterothallic conidia are relatively uncommon. Fig. 4. Comparison of thallic and blastic conidial development. The left hand panel compares holothallic (top) and enterothallic (bottom) conidiogenesis. The right hand panel illustrates holoblastic (top) and enteroblastic (bottom) conidiogenesis. Blastic development is characterised by differentiation of a spore initial from part of a cell rather than the whole cell, and occurs before it is separated off by a septum (Fig. 4B). These spores are called blastic conidia, and, again, may be distinguished as holoblastic (using the original wall) or enteroblastic (using only newly-formed wall). Blastic conidia may be produced from a specialised (conidiogenous) cell that is sometimes another conidium (that is, they may form in chains). One to several conidiogenous cells may be produced from and supported by a conidiophore, a specialised hypha or hyphal branch. When mature, conidia separate readily from the conidiogenous cell, so the spore is described as deciduous. 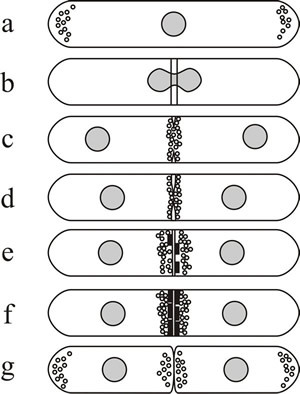 Thallic conidial development is remarkably similar to division of fission yeast, Schizosaccharomyces pombe, in which septation involves chitin deposition in a ring defined by a pre-formed ring of actin microfilaments (Fig. 5). Blastic development has similarities to budding in Saccharomyces cerevisiae, because the conidial initial emerges from a specific localised region of the conidiogenous cell and may enlarge considerably before being cut off by a septum. Ring wall building creates the emergent conidial initial, and then diffuse wall building within the initial causes it to balloon from the parent cell. 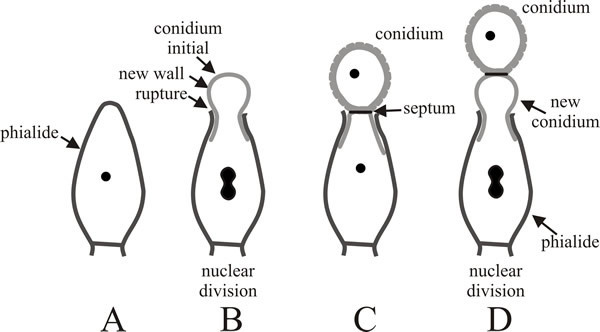 As the conidial initial increases in size a nucleus migrates from the parent cell into the young conidium, which is finally separated from the parent cell by centripetal growth of a septum. The septum sometimes includes a special abscission layer that enables conidial release. Enteroblastic conidia are very commonly encountered. Conidiogenous cells differ morphologically and contribute to the morphological biodiversity of fungi. In some fungi conidiogenous cells are not specialised for the production of large numbers of conidia and are very similar to vegetative hyphae. Other common conidiogenous cells are specialised, non-elongating bottle-shaped cells with a narrow neck from which the conidia develop; these are called phialides (Fig. 6). The first conidium on a phialide may form by either the holoblastic or enteroblastic method. If formed enteroblastically, it ruptures the phialide wall as it emerges, and the ruptured wall may persist as a minute collar at the base of the conidial chain. Either way, development of subsequent conidia is enteroblastic, each one originating as the innermost layer(s) of the phialide wall are extruded through the ‘mouth’ of the phialide. Although they originate on the inner side of the phialide wall, these layers eventually become the outermost layers of the conidial wall. The septum is formed within the phialide to separate the exogenous maturing conidium from the next (endogenous) conidium initial. The spores of Aspergillus are the most frequently-observed conidia that are formed in this way. Fig. 5. Septum formation and cytokinesis in Schizosaccharomyces pombe as an example of thallic development. 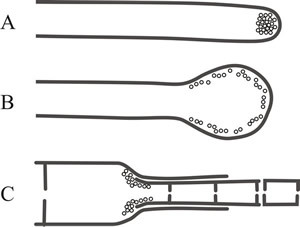 (a) Fission yeast cells grow mainly by extension at both tips, actin is located at the growing ends of the cell (shown here as small circles) and a sheaf of microtubules runs from end to end. (b) When mitosis is initiated, actin is relocated to form an equatorial ring of filaments around the nucleus, the position of which anticipates the position of the septum. (c and d) As mitosis is completed the primary septum originates in the periplasmic space and grows into the cell. (c–e) As synthesis of the septum proceeds, actin distribution changes from a filamentous ring to clusters of vesicles located where septum material is deposited. (e and f) Secondary septa are formed either side of the primary, and the latter is removed to bring about cell separation (g). Redrawn after Moore (1998). Fig. 6. Development of conidia from a phialide. A, slightly elongated phialide with a single wall. B, the apex of the phialide is ruptured by emergence of the enteroblastic conidial initial; the wall that protrudes becomes the external wall of the newly developing conidium. C, the new conidium has been completed and separated by a septum (which may include an abscission layer). D, the process is repeated to form a second conidium beneath the original and as subsequent conidia extend the chain, the oldest is always at the end of the chain and the youngest is emerging from the phialide. Redrawn after Moore-Landecker, 1996.